because nerds see things differently. 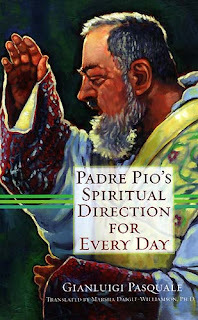 This treasure trove has a short writing from padre Pio for each day of the year. Each quote is no more than a page, so this book is great for even the busiest of us. Padre Pio was very connected to suffering and that which damages us the most and offends Christ. Every page feels like I am getting a look into Christ's heart. For those of you who love quotes, every page is a goldmine. This book could even be a straight read. I know that I didn't want to wait until the next day to gain more insight. For all of you looking to "add a little extra" to your lent, this is your ticket. Copyright © 2009 CatholicNerd All rights reserved. Theme by Laptop Geek. | Bloggerized by FalconHive.